Arval is continuing its work to help employees and customers make the switch to electric with plans to install charging points across its UK premises, including a major site in Swindon. Opening next month, the site at its Windmill Hill Business Park headquarters in Swindon will make 43 charging points available to Arval employees in partnership with NewMotion along with an additional seven for other businesses using the same building. The vehicle leasing and fleet management specialist is also planning to install new charging points at its other UK premises in Manchester and Birmingham. 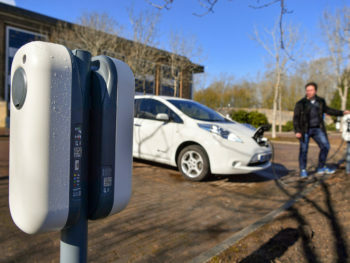 According to Miguel Cabaça, managing director at Arval UK, the new charging development will act as a test ground and working example for customers who are thinking of shifting to electric vehicles for their company cars and vans. The new charging sites underpin Arval’s existing work to help customers with re-evaluating their powertrain choices. Already this year, the firm has launched a new Driver Powertrain Compatibility tool that allows fleets to match drivers to the best powertrain type for their needs. It’s also announced that it will soon introduce an electric charging element to its fuel card offering, bringing quite a different proposition to petrol and diesel fuel management. Arval’s new charging points will also help the growing numbers of its own employees who are turning to EVs. Ailsa Firth, human resources director, commented: “As a business, we are committed to supporting the ongoing energy transition toward electric and plug-in hybrid vehicles and this means giving drivers convenient access to charging points. NewMotion will also hold roadshows at Arval’s UK head office to introduce employees to the charging sites, the surrounding framework and to show them how they work.